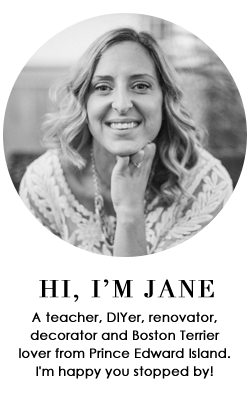 modern jane: A Glimpse Into Julie's Home. A Glimpse Into Julie's Home. First of all, the Elton John Concert was amazing! I'll admit I wasn't dying to go but seeing it for free (I was bartending) appealed to me and let me say, he did not disappoint! He played for nearly 3 hours! Earlier this week I shared my sister's painted sideboard. While I was there I snapped a few pics of the new backsplash in her beautiful kitchen and thought I'd share. The cabinets are creamy white and the countertop is black. It seems complete now with the shiny, muted tiles. There is just something about a new home that just sparkles. I love going over... everything is so clean and fresh feeling and there is potential everywhere! What a pretty kitchen. Can you ask your sister where she got her tile and what the name is. I LOVE it. That is a great backsplash - I love it. Her gallery walk is looking good too. Its lovely thanks for sharing it with us. Do you happen to know where she purchased her tile? It's beautiful. I have similar colors in my kitchen and have been putting off the backsplash because I'm so indecisive! Well it's safe to say that good taste runs in your family! I'm so envious of her beautiful kitchen. And I'm wanting to do a gallery wall of my own soon, so always like to get some new inspiration! LOVe her kitchen. That backsplash is amazing. I have the same cake stand. Woot. What a gorgeous kitchen! Love the backsplash!! Beautiful backsplash! It reminds me of the one in the most recent issue of Style @ Home. Love the black hardware too! This kitchen is my dream combo and I don't kid! I have wedgewood blue walls and iron fixtures and always envisioned creamy white cabinetry and a dark slate colored marble top with the black iron pulls. I am saving this for our future renovation of those cabinets and counter top! As with everyone here I adore that backsplash. Do you know where she got it? Amazing kitchen and I adore the gallery wall. I love your sister's kitchen. Thanks for sharing the backsplash info... Do you happen to know the color of her walls? I've written a post about kitchens and mentioned this one. Hope you stop by for a visit!